I guess it’s time for me to admit that I am an apron-aholic. Funny thing is, I don’t have a cute apron of my very own! Every time I make a new apron, I end up gifting it to a friend or family member. 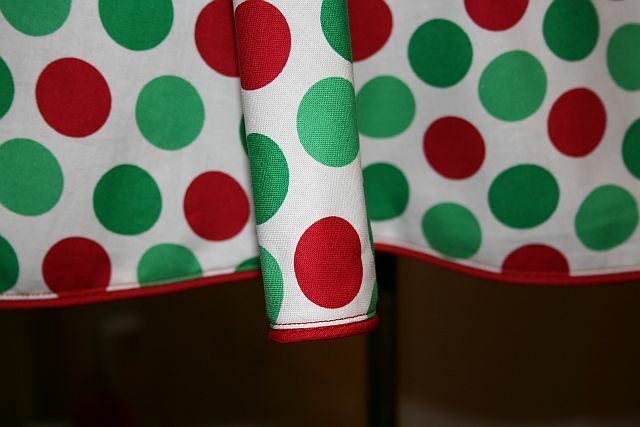 These aprons are very quick and easy to make! Here is the Handy Dandy PDF Ruffled Tea Towel Apron Tutorial that I created for this project. It includes the pattern template to cut out the curved under-arm area, too! 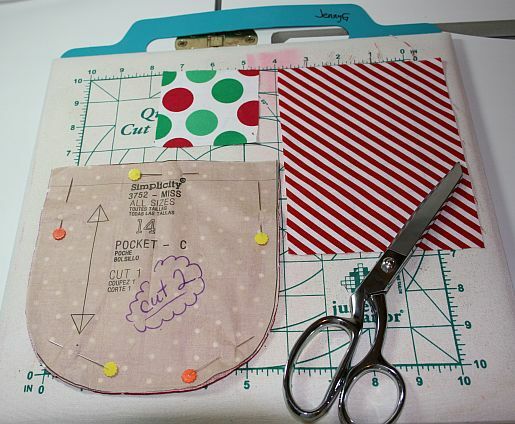 This entry was posted in Aprons, Project Tutorials and tagged accessories, apron tutorial, sewing projects, sewing tips on January 8, 2012 by Jenny Gabriel. 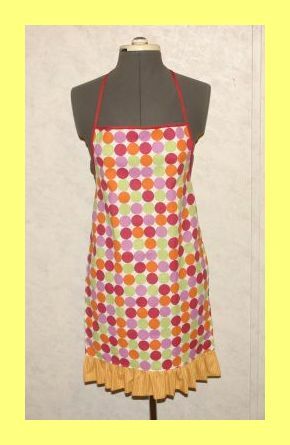 I love this cheerful apron! 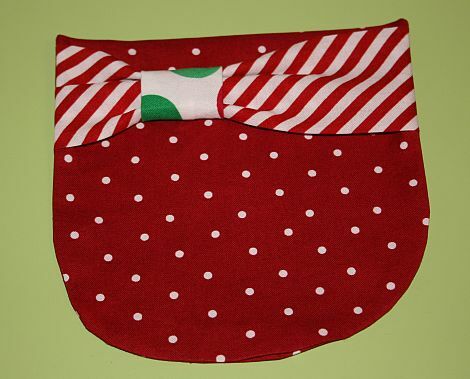 It has a lovely flounce, uses red piping in the flounce/apron seam and also in the apron hem. CUTE! And it uses bias tape to make the waistband and waist ties. The original pattern instructions wanted me to use piping to outline the pocket, but I decided to do something a little different that would allow me to bring in some coordinating fabrics and add a flirty touch as well. 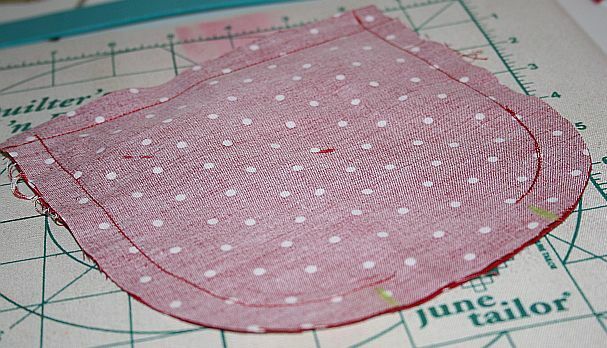 Below, you will find instructions to make this boutique-style pocket as well as a pdf of my customized pocket pattern pieces. Enjoy! 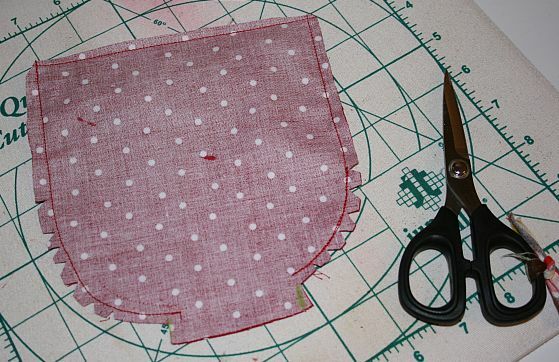 #3Lay the pocket open and press the seam. Set pocket aside. 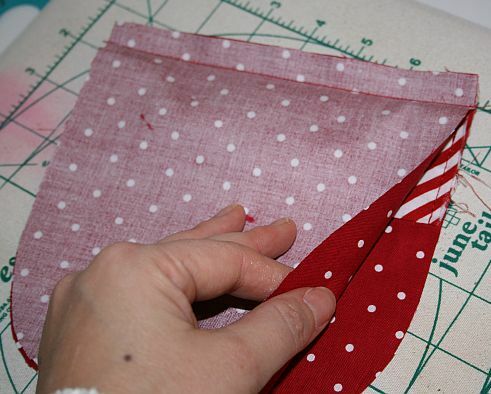 Fold the rectangle piece in half lengthwise and stitch a 1/2" seam down the long edge. 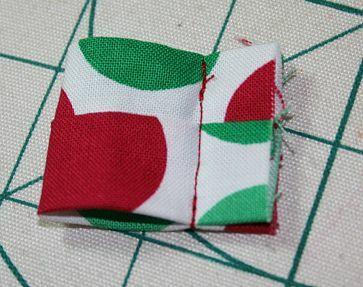 #6Take the 3"x3" square & fold right sides together. Stitch a 1/4" seam on one edge. #7Turn tube right side out and press. Centering seam along back side. #8Fold tube in half with right sides together and matching raw edges. Stitch a 1/2" seam. #9Trim seam & turn right side out. Press. 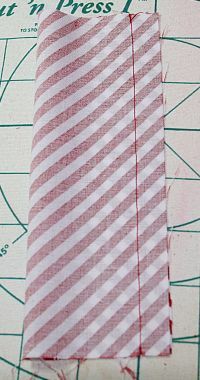 #10Slide the "cube tube" onto the pocket band. 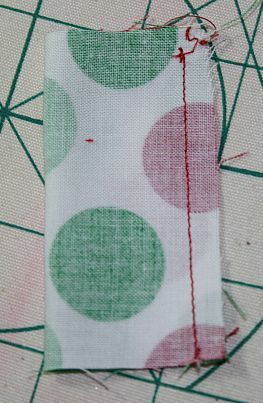 #11Place pocket band onto pocket just below the seam line. Pin & baste in place. #12Lay the main pocket pieces right sides together so that the band is sandwiched in between. 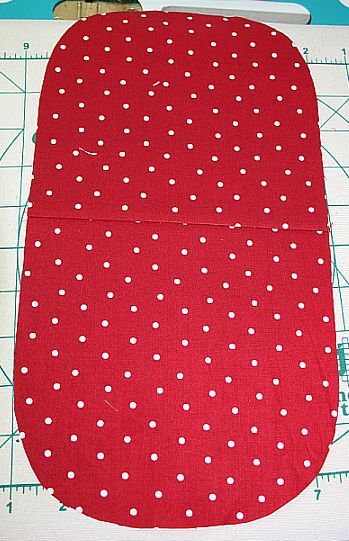 #13Stitch around the sides and bottom curve with a 1/2" seam. 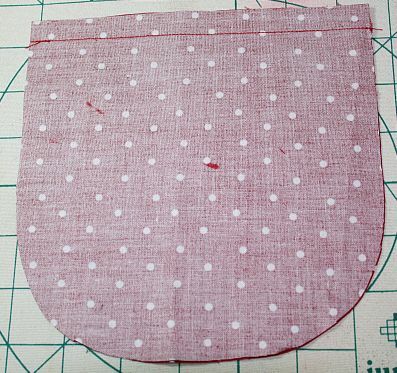 Make sure to leave an opening along the bottom so you can turn this pocket right side out. Turn pocket right side out and press. 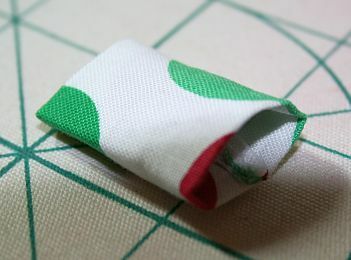 You could hand sew the "cube tube" in place to prevent it from slipping later. 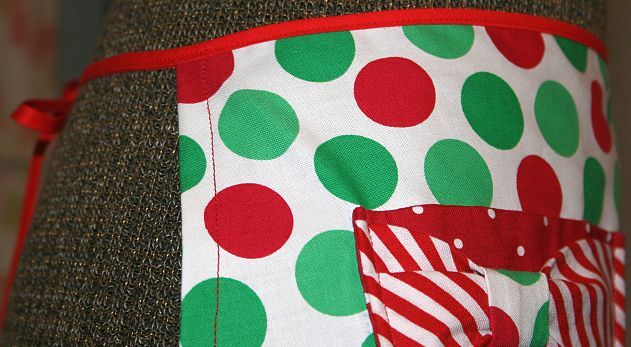 Pin pocket to the apron and sew in place by stitching close to the edge around the pocket's sides and bottom. 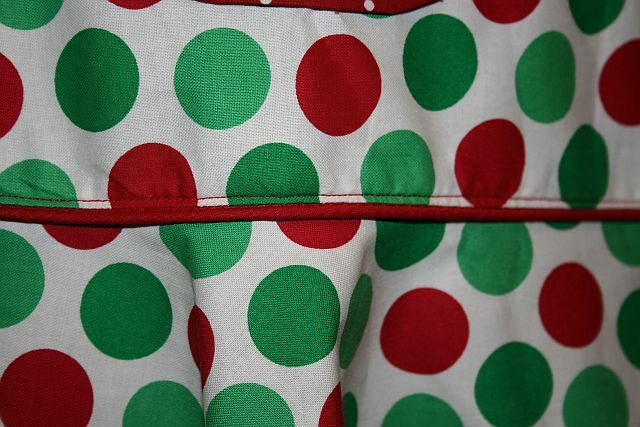 Close-up of piping in the flounce/apron seam. Close-up of piping along apron's hem. 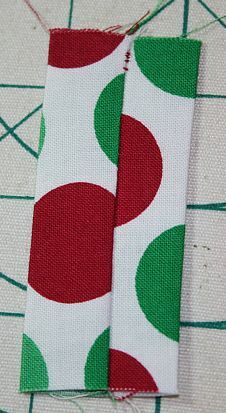 Close-up of bias-tape waist ties. Thanks so much for reading. 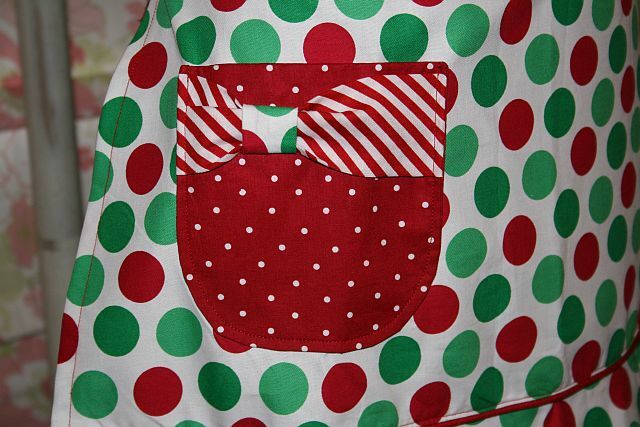 I hope you get a chance to try this pocket tutorial on your next apron or even a cute skirt! 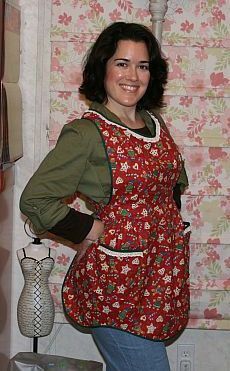 This entry was posted in Aprons, Project Tutorials, Sewing FYI, Tips/Techniques FYI and tagged apron pattern, bias tape, piping, Sewing FYI on December 21, 2011 by Jenny Gabriel. 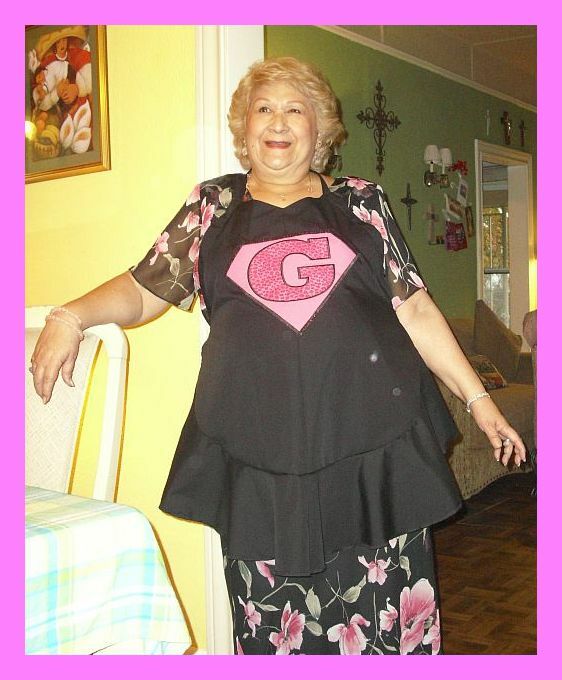 And, in that post, I mentioned that since my Grandma is a Super G, I will make her a black apron and put this leopard pink super G on it…..
Last night was her birthday party and she loved her new apron! I was able to make this apron in record time by using my serger to finish the raw edges of the flounce, waist ties & facings instead of pressing and stitching a narrow hem. I also used my serger to attach the flounce so I saved some steps there, too. My serger stitched the seam, trimmed away the seam allowance, and finished the raw edge all in one pass. Just call me Speedy! I used my sewing machine to attach the apron’s V-neck facing so I could precisely pivot at the point of the V. I also used my sewing machine to do the understitching for the neck facing as well as stitching in the ditch to apply the side facings. Overall, it turned out lovely and I’m so glad that she likes it. By the way, this is Butterick pattern 4945 – in case you’re interested in making your own! Well, that’s all for now! I’m off to stitch up an in-the-hoop wallet for my very cool Uncle Jacob. I found a new way to “wrap” the gift that I think will be a big surprise to him…. I’ll share some pictures in a bit! 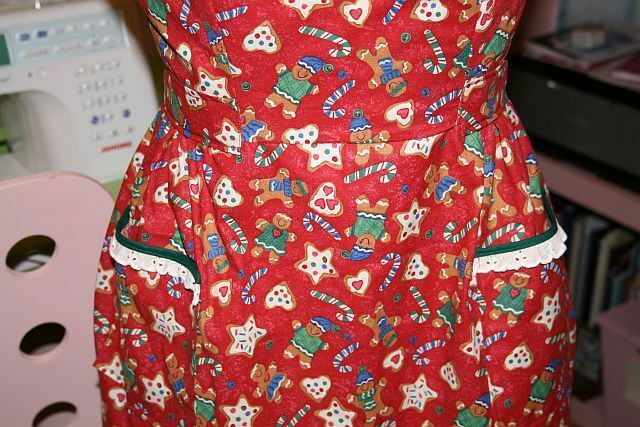 This entry was posted in Aprons, Serger FYI, Tips/Techniques FYI and tagged apron pattern, butterick 4945, machine embroidery, serger tips, sergers on December 18, 2011 by Jenny Gabriel. Still Busting My Fabric Stash: Just Made the Cottage Apron! Cottage Apron from book: "One Yard Wonders"
In between blog posts, thinking of new give-aways, being a home school mom, shuttling my kids to dance classes, teaching sewing classes, etc., I am still diligently chipping away at my fabric stash. Remember those cute place mats I just made and posted a tutorial for? 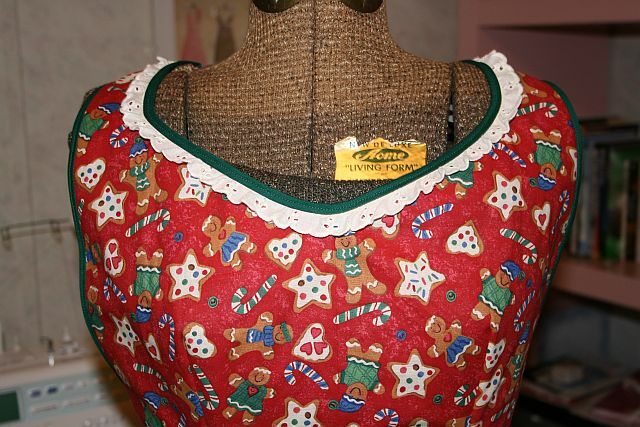 Well, I had about one yard left over of the gingerbread fabric and I said to myself, “Self! 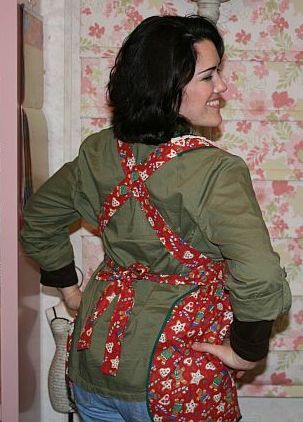 You can make the cottage apron from that sweet book you just bought! Your friend Stacie just did, and hers turned out so cute!” So……I did. The patchwork place mat has matching gingerbread fabric on the back. It's there......trust me. The apron pattern called for using ribbon for the waist ties and back straps, but I didn’t have any 2″ wide ribbon on hand. So, I made straps from the remainder of my fabric. Here’s a view of the back of the apron. 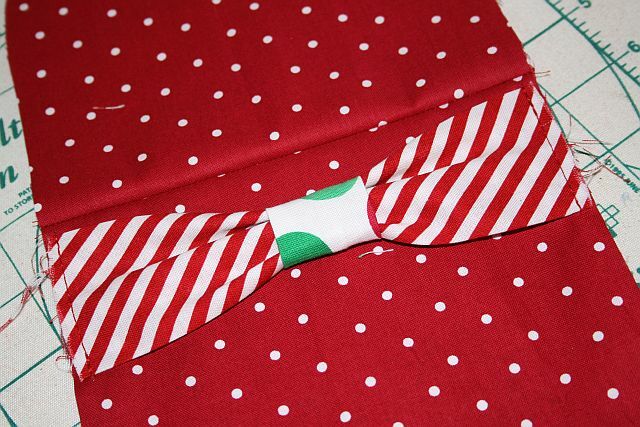 The pattern calls for sewing the eyelet to the neckline of the apron AFTER the bias tape binding. This makes the eyelet point towards your face. I liked the way Stacie did hers, so I followed her example instead of the instructions. Also, the pattern did not call for trimming the pockets with the pre-gathered eyelet, but I love eyelet. So, I chose to add in an extra touch of it…. Victory!!! One more yard of fabric is officially BUSTED! With the gathers, bust darts, eyelet trim, criss-cross tie backs, etc., I think this is one of the “cutest” aprons that I’ve made so far. I hope you like aprons, too, because, I’ve got a shameful amount of patterns and good intentions to sew them out soon…… Be forewarned, more aprons to come! This entry was posted in Aprons, Project Tutorials, Sewing FYI, Tips/Techniques FYI and tagged apron pattern, Cottage Apron, One Yard Wonders, Sewing FYI on December 8, 2011 by Jenny Gabriel. 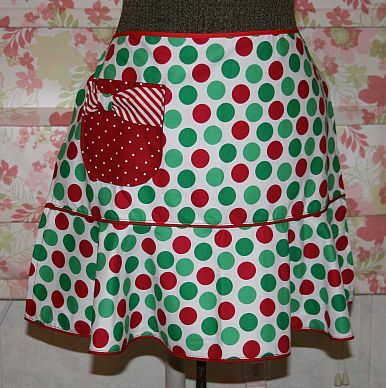 Holiday Ruffled Apron – Lovely Hostess Gift! Here’s a fun project that I adapted from a photograph that I saw in a magazine a while back. 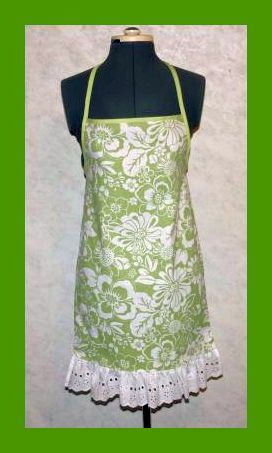 This apron doesn’t take much fabric and from start to finish, only takes a few hours to make. The color coordinating options are endless, so you could make it with a variety of fabric themes like: Christmas, Thanksgiving, Birthday, and more! Have fun! And I would love to see a picture when you finish yours! 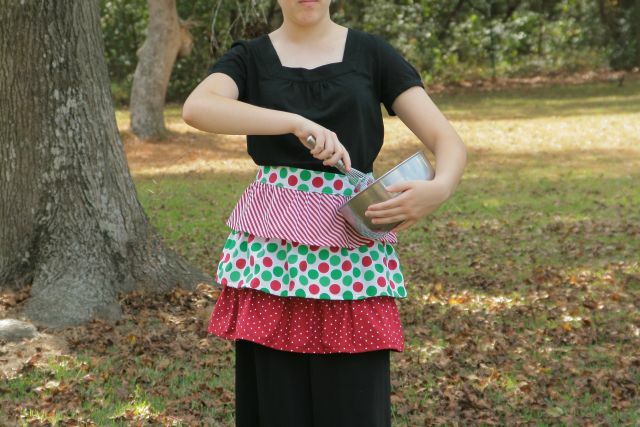 This entry was posted in Aprons, Project Tutorials, Sewing FYI, Tips/Techniques FYI and tagged apron pattern, DIY, free pattern, free sewing pattern, gift ideas, sewing ruffles on November 3, 2011 by sewvacoutletblog.